Small, simple, pet friendly, bungalow, located close to the water and near several popular hiking trails. This single story, comfortable, rustic, home is surrounded by the unkempt beauty of Cambria’s forests. The home includes a full kitchen, simple living room, and two cozy bedrooms. 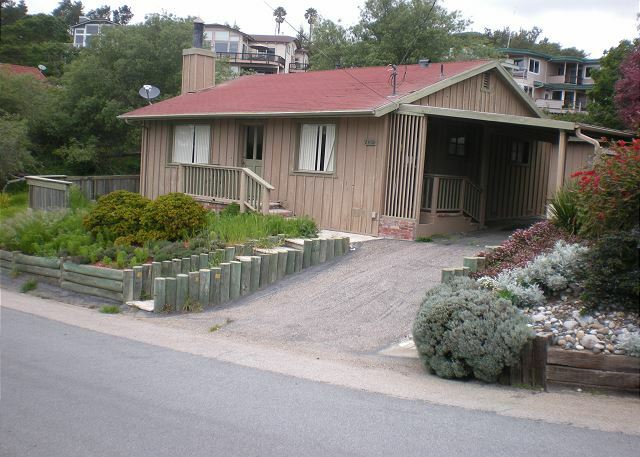 Come explore Cambria’s natural beauty while staying in this charming home. Linens not provided. It's all about expectations. If you expect this house to be in perfect condition with high end finishes, you are going to be disappointed. The home and everything in it is older. The furniture could use some updating/replacing. 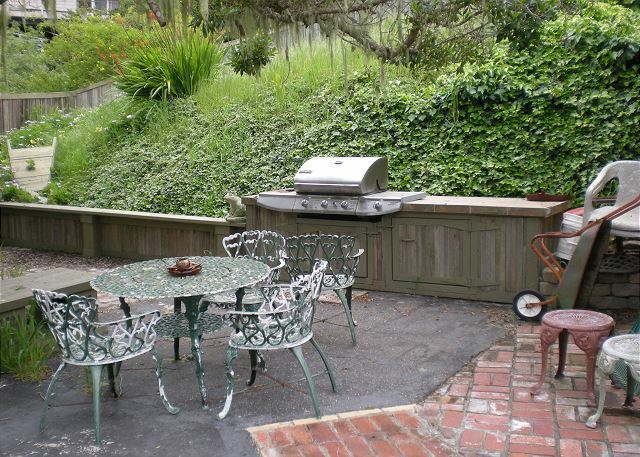 But it is in a great neighborhood along the central coast and is dog friendly. If like us, you expect to be out all day exploring the central coast with your dog and just need a place to sleep at the end of the day, this place is perfect. We would stay here again. We've enjoyed this quiet,cozy abode for 4 summers. It's always nice to go to beach with the dog and stay in this fine community. When the plumbing was in "need" the management brought a great plumber to the rescue. The new water heater arrived, the bathroom sink drains, and the toilet flushes! We look forward to returning next summer. Thank you! We loved our weekend get away and we loved staying in this home. It was comfy and convenient. So close to everything. Quick access to the beach and Main street. Everything was clean and maintained. Another stay in the bungalow and we it met our basic needs. My wish is for updated furniture in the living room and newer carpet, but I guess their condition is reflected in the price per night. Everything else in the house if fine. We will continue to come back every year because we love the location, deer, and back yard. There is a 48 inch screen TV with cable to enjoy and a landline phone for emergencies since there is no cell coverage or internet. Google the address for updated photo of the outside of the house. My family and I had a great time in this little house it is exactly like mine back home. comfortable, clean and peaceful. we will be coming back again. oh and sooo close to the beach that was awesome. I've already recommended it to my co-workers. 2400 Madison has been my "home away from home" the past two summers. The small, cozy house offers basic amenities and privacy. I didn't know that waterbeds still exist! My dog and I took a walk to Fiscalini Ranch and through the quiet neighborhood every day. It's a short drive to downtown Cambria and long beaches to stroll on. I always communicated with kind people where ever I went, such as; the restaurants, library, farmers market, parks, neighbors, beaches. My family and I look forward to being in Cambria many times. Thanks!!! Best price for a bare bones place! Our family of 5 + large dog is able to live in very tight conditions relatively well so we were able to handle this place. It is only a five minute walk straight down to the beach and/or the beautiful trails at Fiscalini Ranch which is very convenient. Kitchen was adequately stocked but the water bed needed to be filled higher and I was shocked that they didn't have a $20 DVD player in the place - - only an outdated VHS. But, if you are on a tight budget and want to be CLOSE to the beach and CLOSE to your family, this is the best deal that I have ever found. Third visit to this house because the price, location, and amenities are right for us. We are a couple who travel with dogs. We enjoyed the peace and quiet of the area, the large TV, the walking distance to Fiscalini ranch trail and ocean,and the backyard. Our dogs loved the backyard hill. The property is fenced though not completely. We know this and bring our own boards to block the the carport opening. We enjoyed driving to San Luis Obispo to the drive-in movie theater and were able to bring our dogs with us! Cambria and surrounding towns are very dog friendly. We return year after year because of this and the beautiful empty beaches that the dogs run everyday. Check to see if you are at the right beach that allow dogs off leash. Many restaurants have patios that are dog friendly. The basics that this simple house has was enough for our stay. There is enough plates and pots and pans to cook meals in. We don't mind bringing our own sheets and towels to stay. The house was clean though living room furniture is showing signs of wear. For the first time the second bedroom water bed was heated! We again wish for at least internet since there is no house phone or cell coverage. Bathroom sink still drains slow even though I used a bottle of Drain-o. Google the address to see updated pictures of the outside of the house. 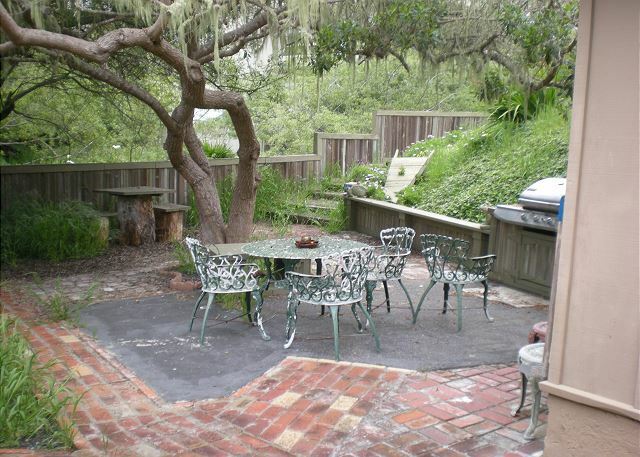 overall considering the location, near hiking trails and otter cove, and the general geography of cambria, this makes for an excellent nature lovers vacation site. If you interest is indoor luxury it may not be a fit. My only complaint is the living room furniture needs to be replaced it is soiled. And the picture in the add should be updated, the property has been changed for the better since the photo you see. Our fourth trip to Cambria, our second trip to this house. We came back to this house and stayed for 2 weeks because of several things. 1. We liked the location. It is close to Fiscalini Ranch Preserve and we can hear and see a peek of the ocean. It's an easy drive into town too. 2. It is a dog friendly rental with a back yard that it 85% closed in. We brought boards with us to block the carport width opening to keep the dogs from getting out. 3. 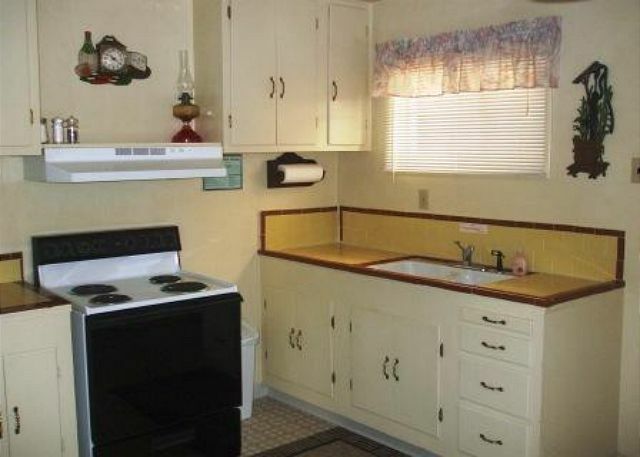 It's small and cozy with a decently stocked kitchen and BBQ. 4. It is a 1 story house with only 3 small steps into the house. 5. The price is right! On our wish list for the next visit: Internet connection. There is none but its needed especially since there is no ATT cell coverage. In all, we thoroughly enjoyed our stay in the house. The updates to the front of the house, back yard, and bathroom are wonderful. Overall really good. A little hick-up with the prior cleaning but the mgmt refunded the fee. 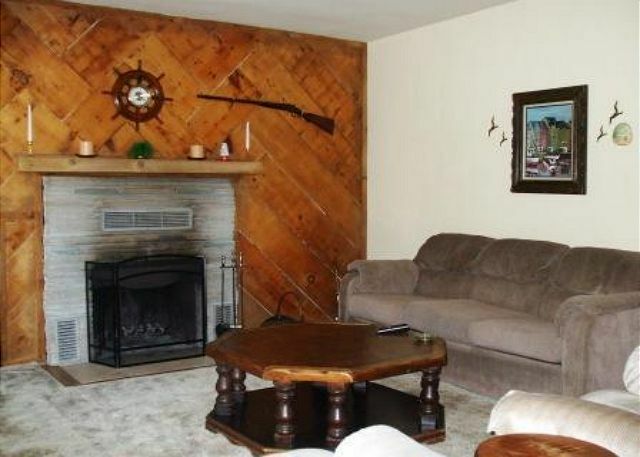 This rental has had some updating inside & out. It's better than the pics and you can't beat the price. For 2 people (with pets) it's a no-brainer. 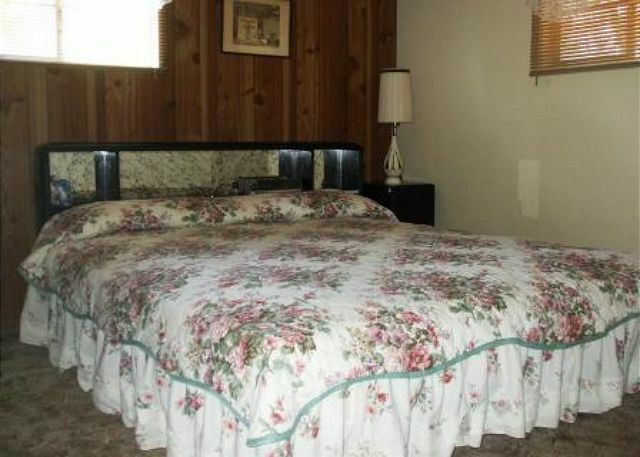 We liked this property, but for some reason, we didn't know that sheets and towels were not provided. 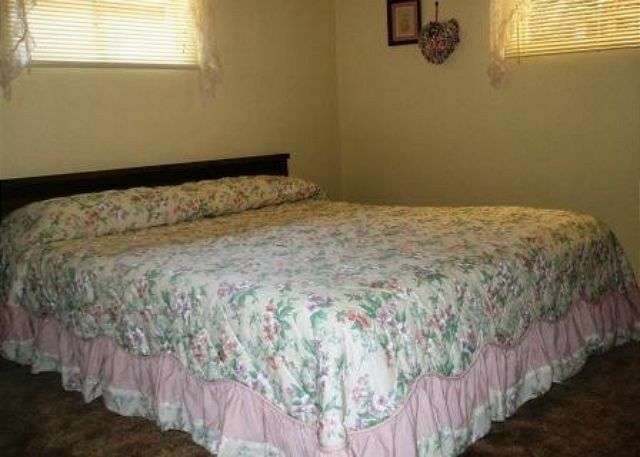 (we don't mind bringing our own sheets and towels, but we should have had advance notice about it) Also, we didn't know one bed was a waterbed, we should have had prior notice of this also. The drainage in bathroom sink and toilet seemed kind of sluggish. Quiet, rustic cabin. Great location. My family and I stayed here for a week over the summer and I wish we could have stayed longer. We weren't looking for anything fancy, but cozy it was! Nestled away in a quiet neighborhood and only a 5 minute walk away from coastal access, this little gem of a cottage was perfect for the quality family time we were seeking. The kids loved exploring the rocky coast every morning with our dog. The kitchen had everything we needed and more. The living room had a very nice large flat screen TV, with one located in the master bedroom as well; both had premium cable channels. The only downfall was not having internet access or a washer and dryer. We look forward to staying here again and I highly recommend it. My husband and I stayed here 10 nights June/July with our dogs. We usually spend time in Cambria every 6 months. The bungalow has some updates to the face of the house, in the bathroom, and in the front and backyard. The backyard is now semi fenced in with a nice patio area and BBQ. It was a perfect place to relax, BBQ,see the deer go by, and for our dogs to use. The yards' only opening is the carport but we closed off this area with boards we brought to make the yard completely closed. The kitchen had all the amenities needed to cook. The living room has a new big flat screen TV with a good selection from Dish Network. The furnishings in the living room are worn but I suppose one doesn't want to put new, nice furniture in a pet friendly rental. There is absolutely no cell coverage at the house along with no internet. There is a house phone. If there was at least internet, we could easily spend 1 month a summer here and winter here too. The location was fantastic. We could hear the waves,(peak of the ocean)and occasionally the elephant seals. We saw deer everyday. Fiscalli Trails are within walking distance. We brought our own sheets, towels, pillows and blankets. There are pillows and blankets in the closet. There is no washer and dryer but there is a laundromat in Cambria. We will most likely return since the price was good but can't stay for long without cell coverage and internet at the house. In all, we give it thumbs and paws up! My Dad has a walker and we were able to negotiate the few steps to get into the house. He could get around the house and we were delighted. The kitchen was fully equipped so next time I just will take food! It was nice to discover a hide-a-bed couch. We had a little view which delighted Dad. Thanks for providing a pleasant retreat for us. We will be back. This was a very cute rental home. Excellent location to walking trials. Which there was an enclosed yard for our dog to run around or grassy are but not a big deal. Would recommend this home to other guests. Would like to come back again! Very refreshing, a little off the beaten path, yet very close to everything the area has to offer. a tremendous feeling of being in the conforts of your own home in a very quiet and beautiful setting, the staff is also the best. We look very much towards our next stay.